I post a lot about sales. I love finding discounted gems at J.Crew and Anthro but sometimes I forget to post about retailers that have great prices all the time. I am going to start a new series doing just that. 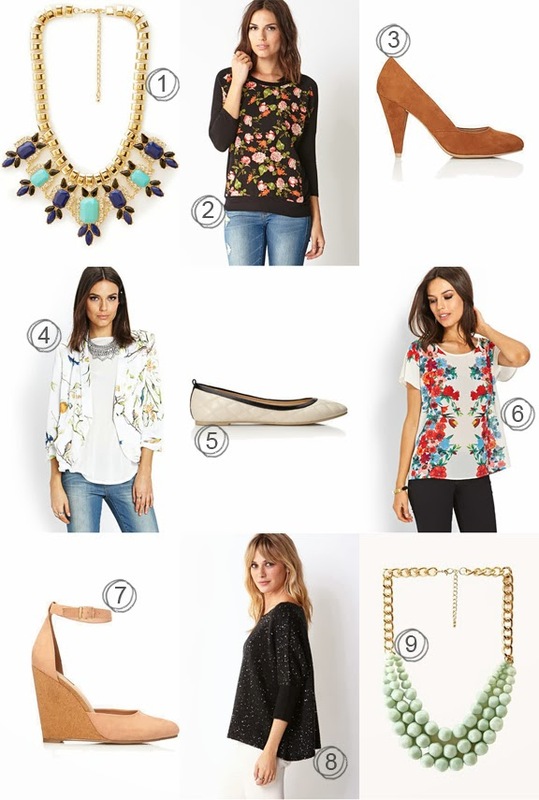 I will spotlight some of my best finds at stores like Forever 21, Target, and Old Navy. Those necklaces are great! They also have a whole bunch of kimonos on their site right now. My second peanut is due on May 5th, and I feel like a kimono would look so cute layered over nursing tanks. LOVE #3--they look like those UO ones from a while back! I've also got my eye on 5 and 9! Love this idea! Forever 21 is killing me with their shoe collection right now! Old Navy really has been hitting it out of the park lately! A lot of their stuff is very Madewell/J.Crew-esque.